Vivid Yellow Loose Sapphire 2.12ct Brilliant Cut. Grade (IF). A Very Beautiful Vivid Yellow Round Brilliant Cut Loose 2.12ct Natural Sapphire From Thailand. An oval cut Sapphire with a stunning yellow colour. There is an additional patch of "parti coloured" blue, that shows as a band around the middle of the stone. Unusually for Sapphire, there is no colour zoning and the colour is well saturated. The gem is well cut, and polished to a nice finish, with very little facet abrasion at all. I cannot be certain as to treatments of this gemstone so I have listed it as "heated", as I have been unable to prove definitively otherwise. All my gems come with a small gift. It is just a little fun to go with your purchase. To make it interesting for those who want the challenge of identifying the gem themselves, the gem id is in a closed slip..
Certified 1.17ct Oval Cut Eye Clean Green- Yellow Natural Sapphire. A 1.17 Carat Bi-Colour Green -Yellow Oval Cut Natural Sapphire. Eye Clean. Cut Is Good, Polish Very Good. Good Entry Level CGL Certification. CHECK OUT OUR OTHER GREAT DEALS. Ceylon genuine not enhanced untreated yellow Sapphire. The colour yellow may show darker in the photo than it is on your device. Size mm Length: 10.5 Width: 9.2 Depth: 7.0. Oval faceted translucent from a parcel of 31 gems 3.8cts to 6.8cts. Fully certified by IGI in Antwerp, one of their best and most well equipped gem labs. Natural untreated Sapphire with a beautiful vivid yellow colour. Totally untreated and unheated. 0.97 carat stone so a good size, with an excellent pear cut. 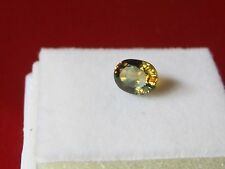 CERTIFICATE Inc. 1.26ct 6.5x6mm VVS Heart Natural Unheated Yellow Sapphire, Ceylon. This Natural Sapphire originate from Ceylon and it weigh 1.26 carats. This Yellow, Heart shape stone, is size 6.57 x 5.95 x 4.06 mm. Ceylon genuine not enhanced untreated yellow Sapphire. The colour yellow may show darker in the photo than it is on your device. Size mm Length: 9.5 Width: 8.9 Depth: 5.2. Oval faceted translucent from a parcel of 31 gems 3.8cts to 6.8cts. Type Natural Green Sapphire. Weight 1.95 Cts. Clarity VS ( /- ). Shape Oval. Secondary Hue: Orange. Primary Hue: Yellow. Oval mixed cut. 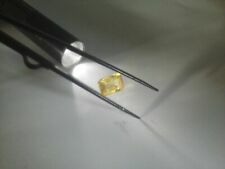 Type Natural Yellow Sapphire. Weight 3.20 Cts. Clarity VS ( /- ). Shape Oval. Natural Cognac Yellow Sapphire. This stone is totally untreated and unheated. Still a great price for such a unique and untreated stone. 1.24 carat stone so a good size, with an excellent pear cut. Ceylon genuine not enhanced untreated yellow Sapphire. The colour yellow may show darker in the photo than it is on your device. Size mm Length: 9.7 Width: 7.9 Depth: 5.3. Oval faceted translucent from a parcel of 31 gems 3.8cts to 6.8cts. Natural untreated Sapphire with a beautiful pinkish yellow colour. Fully certified by IGI in Antwerp, one of their best and most well equipped gem labs. Totally untreated and unheated. We only deal in natural, earth mined gemstones. Bright yellow Sapphire 4.5x6 pear 0.5ct gem AA. Faceted natural Sapphire - for Gemstone collectors, for Jewellery designers or for Mystic and positive energy as an amulet. Clarity: AA - lightly included. Ceylon genuine not enhanced untreated yellow Sapphire. The colour yellow may show darker in the photo than it is on your device. Size mm Length: 10.3 Width: 7.5 Depth: 5.0. Oval faceted translucent from a parcel of 31 gems 3.8cts to 6.8cts. Ceylon genuine not enhanced untreated yellow Sapphire. The colour yellow may show darker in the photo than it is on your device. Size mm Length: 10.5 Width: 8.9 Depth: 6.9. Oval faceted translucent from a parcel of 31 gems 3.8cts to 6.8cts. Ceylon genuine not enhanced untreated yellow Sapphire. The colour yellow may show darker in the photo than it is on your device. Size mm Length: 10.0 Width: 7.9 Depth: 5.3. Oval faceted translucent from a parcel of 31 gems 3.8cts to 6.8cts. Ceylon genuine not enhanced untreated yellow Sapphire. The colour yellow may show darker in the photo than it is on your device. Size mm Length: 10.7 Width: 9.3 Depth: 4.7. Oval faceted translucent from a parcel of 31 gems 3.8cts to 6.8cts. NATURAL UNHEATED LEMON-YELLOW SAPPHIRE GEMSTONE LOOSE MARQUISE-CUT 9 x 4.5 mm. Product Specifics: on sale is attractive light yellow lemon colour marquise cut natural sapphire loose gemstone, which is unheated and unt reated. It shows moderate to heavy signs of visible inclusions & is ready to be mounted in jewellery of your choice. Ceylon genuine not enhanced untreated yellow Sapphire. The colour yellow may show darker in the photo than it is on your device. Size mm Length: 10.9 Width: 8.6 Depth: 6.0. Oval faceted translucent from a parcel of 31 gems 3.8cts to 6.8cts. Product Specifics: on sale is lot of 10 pieces of wonderful natural sapphires loose gemstone. these are unheated & untreated, shows very slight slight to no signs of visible inclusions & are round cut ready to be mounted. Ceylon genuine not enhanced untreated yellow Sapphire. The colour yellow may show darker in the photo than it is on your device. Size mm Length: 9.5 Width: 7.3 Depth: 5.5. Oval faceted translucent from a parcel of 31 gems 3.8cts to 6.8cts. Please see a picture of lab certificate for all details about the sapphire. Ceylon genuine not enhanced untreated yellow Sapphire. The colour yellow may show darker in the photo than it is on your device. Size mm Length: 9.7 Width: 8.2 Depth: 6.0. Oval faceted translucent from a parcel of 31 gems 3.8cts to 6.8cts. Ceylon genuine not enhanced untreated yellow Sapphire. The colour yellow may show darker in the photo than it is on your device. Size mm Length: 11.5 Width: 9.0 Depth: 5.0. Oval faceted translucent from a parcel of 31 gems 3.8cts to 6.8cts. 0.72ct 6x5mm Oval Natural Orange & Yellow Sapphire Songea, Tanzania. This Natural Sapphire originate from Songea, Tanzania and it weigh 0.72 carats. This Orange & Yellow, Oval shape stone, is size 6.0 x 5.0 x 3.0 mm. Ceylon genuine not enhanced untreated yellow Sapphire. The colour yellow may show darker in the photo than it is on your device. Size mm Length: 10.3 Width: 9.7 Depth: 4.5. Oval faceted translucent from a parcel of 31 gems 3.8cts to 6.8cts. Product Specifics: on sale is natural sapphire. it displays beautiful rich yellow colour and is oval cut ready to be mounted in jewellery of your choice. it is a clean sapphire. known as pukhraj in vedic astrology. Very beautiful natural untreated sapphire. Deep Yellow Oval Cut Natural South African Sapphire. Ceylon genuine not enhanced untreated yellow Sapphire. The colour yellow may show darker in the photo than it is on your device. Size mm Length: 10.8 Width: 8.8 Depth: 6.6. Oval faceted translucent from a parcel of 31 gems 3.8cts to 6.8cts. Natural yellow sapphire from Sri Lanka. WEIGHT: 4,70 Cts. Color : see as picture. Product Specifics: on sale is lot of 5 pieces top class golden yellow colour princess/square cut natural sapphires loose gemstone, these are unheated & shows no signs of visible inclusions & is of very good quality. WEIGHT: 2,35 Cts. Color : see as picture. Ceylon genuine not enhanced untreated yellow Sapphire. The colour yellow may show darker in the photo than it is on your device. Size mm Length: 10.3 Width: 8.7 Depth: 7.0. Oval faceted translucent from a parcel of 31 gems 3.8cts to 6.8cts. This amazing Yellow Sapphire is now availbe for purchase. Purchased at an auction and now ready to move on. Originated from Sri Lanka, then went to get it's beautiful cut in an Indian lapidary. Shape: Emerald Origin: Sri Lanka Treatment: Heating Transparency: Transparent Total Carat Weight: 7.35ct Length: 9.4mm Width: 9.4mm Depth: 4.5mm Clarity Grade: Eye Clean Mohs Scale: 9 Luster: Vitreous Specific Gravity: 4 Species: Corundum Definitely message me in regards to receiving different photographs is these do not suffice. I want you to be 100% certain before purchasing. Am open to sensible offers. Ceylon genuine not enhanced untreated yellow Sapphire. The colour yellow may show darker in the photo than it is on your device. Size mm Length: 9.4 Width: 8.5 Depth: 5.7. Oval faceted translucent from a parcel of 31 gems 3.8cts to 6.8cts. Ceylon genuine not enhanced untreated yellow Sapphire. The colour yellow may show darker in the photo than it is on your device. Size mm Length: 10.7 Width: 8.5 Depth: 5.4. Oval faceted translucent from a parcel of 31 gems 3.8cts to 6.8cts. Ceylon genuine not enhanced untreated yellow Sapphire. The colour yellow may show darker in the photo than it is on your device. Size mm Length: 10.1 Width: 8.6 Depth: 5.7. Oval faceted translucent from a parcel of 31 gems 3.8cts to 6.8cts. Ceylon genuine not enhanced untreated yellow Sapphire. The colour yellow may show darker in the photo than it is on your device. Size mm Length: 10.5 Width: 8.2 Depth: 6.1. Oval faceted translucent from a parcel of 31 gems 3.8cts to 6.8cts. Ceylon genuine not enhanced untreated yellow Sapphire. The colour yellow may show darker in the photo than it is on your device. Size mm Length: 10.7 Width: 7.9 Depth: 6.0. Oval faceted translucent from a parcel of 31 gems 3.8cts to 6.8cts. Ceylon genuine not enhanced untreated yellow Sapphire. The colour yellow may show darker in the photo than it is on your device. Size mm Length: 11.3 Width: 8.1 Depth: 5.9. Oval faceted translucent from a parcel of 31 gems 3.8cts to 6.8cts. Ceylon genuine not enhanced untreated yellow Sapphire. The colour yellow may show darker in the photo than it is on your device. Size mm Length: 10.5 Width: 8.4 Depth: 6.5. Oval faceted translucent from a parcel of 31 gems 3.8cts to 6.8cts. Ceylon genuine not enhanced untreated yellow Sapphire. The colour yellow may show darker in the photo than it is on your device. Size mm Length: 12.4 Width: 9.8 Depth: 4.5. Oval faceted translucent from a parcel of 31 gems 3.8cts to 6.8cts.